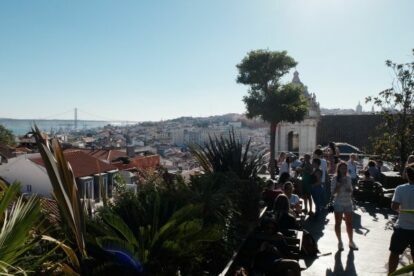 If you like surprising spots in unpredictable places, PARK Bar in Lisbon is for you. Not just for the place itself but for the experience of arriving there. Walk down Calçada do Combro on the right side of the street until you get to a big gray and cold parking lot building. That’s right. It may feel strange because all you can see is cars and fences and you think “wait, this is a no walking-person zone”… but yes, that’s the way in! PARK is on the 7th floor but believe me it is worth the walk. It’s like arriving at an oasis garden, or a Balinese beach bar, with plants and wooden decks, but on a city rooftop. You instantly feel the groove of the DJ’s music and the cool and friendly atmosphere. Take your friends there at the end of the day and finally relax and enjoy the incredible view, in between delicious burgers and your favorite drinks.